It used to be that the teams that specialized in getting those three-and-outs were the ones that won championships: offense wins games – defense wins championships. No offense, but times have changed. Tonight’s national championship game will pit two of the country’s top offensive teams against each other, while the top defensive teams sit at home, watch the game on the telly and try to figure things out. The transition of championship teams from predominately defensive to offensive — and how this relates to tonight’s game — is the subject of this week’s Three-and-Out. 1. The Bowl Season. If it were still true that defense wins championships, defensive teams would have dominated their bowl games, and offensive teams – not so much. That is simply not the way it came down this season. 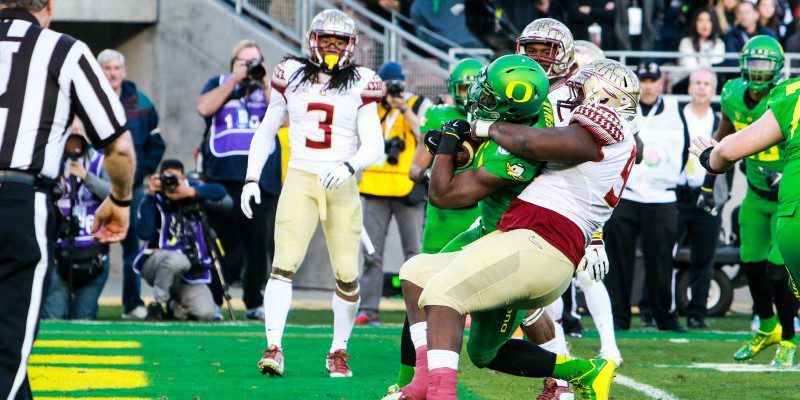 Oregon ran up 45 points on Stanford, one of the few top defensive teams that won its bowl game. Of the top ten scoring defensive teams, one (6-6 Temple) did not receive a bowl invitation. Of the remaining nine, only four (No. 2 Stanford, No. 5 Memphis, No. 7 Clemson and No. 8 Penn State) won their bowl games. Biting the dust were No. 9 Central Florida and four top powers from what is ironically at the same time one of the most offensive and least offensive divisions in college football, the SEC West. Ole Miss — the country’s least scored upon defense — went down, along with No. 3 LSU, No. 4 Alabama and No. 10 Mississippi State. That leaves the top scoring defenses at 4-5 in bowl games, with one team not even invited – not too impressive for a group that is supposed to win championships. The top scoring offenses, on the other hand, fared quite well. No. 10 Georgia Southern (9-3) was not eligible for a bowl bid because it had just moved up from FCS ball. The top rated scoring offense (Baylor) and seventh-rated Michigan State couldn’t both win, because they were playing each other. That left eight possible games for the top ten scoring offenses to win. And in those bowl games, the top offenses won eight out of eight. No. 2 Oregon, No. 3 TCU, No. 4 Marshall, No. 5 Ohio State, No. 6 Western Kentucky, No. 7 Michigan State, No. 8 Georgia, and No. 9 Boise State all won by doing what they do best, scoring an average of 45 points per game in their bowls. 2. What It Means. There’s always a chance that it’s just an anomaly, and that next year defensive teams will again prevail. The top defensive teams’ struggles in bowl games this year centered around the SEC West, and it may be that it wasn’t so much that the SEC West teams were that great on defense as it was that they (and the teams they played) were just not very good on offense, thus skewing the numbers. 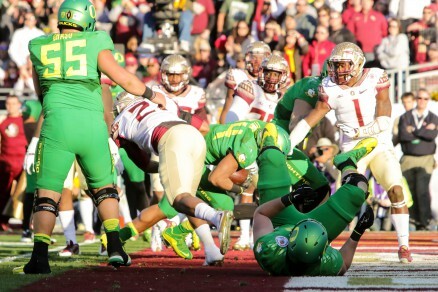 Thomas Tyner scores one of his two touchdowns as the Ducks set Rose Bowl scoring record against Florida State. But there’s no doubt that the game has changed, and that the change is offensive driven. Chances are that the days of baseball-esque football scores of 3-0, 7-6 and 10-7 are gone for good, and we will get used to reading the fine print on the bottom of television screens to see whether that 59-48 score was for football or basketball. Doubtlessly, spread and no-huddle offenses put more pressure on defenses. It is likely that to some extent defenses will adjust over time and regain some of the advantage. Just as offenses came up with new schemes, defenses will probably respond with their own new schemes and specifications for player personnel. Depth charts, speed of rotation and player size will all come into play. Discipline and smarts may become more important in recruiting. Longer frames that can carry more weight without sacrificing speed may become the norm for front sevens. 3. The Oregon Plan and Tonight’s Game. No one questions that Oregon is on the cutting edge offensively. Defensively, “cutting edge” doesn’t seem to apply — or does it? Though ranked 83rd in yards surrendered per game, the Ducks rank 29th in scoring defense at 22.5 points per game, a measly 1.3 points per game behind Ohio State (which ranks 15th in yards per game) — and the Ducks achieved this three-touchdown and half a field goal average playing against a higher level of offensive competition. On the surface it’s nonsense to let opponents move the ball up and down the field and then put on the stops once they cross the twenty. Why not just stop them earlier? This is the paradox of having a defense that is ranked 83rd in yards per game and 29th in scoring, and that may well end up being the key to the National Championship Game: Which statistic will prevail? Many things can stop an offensive drive — a penalty, a stop here or there putting an offense in third and long…a fumble…an interception…an errant pass or two. Even on a successful drive, the chances of a “long” play disappear with the shortened field. The defense knows there will be no 40-yard passes from the 20 yard line and tightens up. If it gives up a field goal that’s answered by a touchdown, it’s a win. The “bend-but-don’t-break” may be the perfect defensive answer to the modern offense, but it doesn’t come without its own set of risks, the major one being that the opposing team will simply “pound it in.” This is especially risky against Ohio State, which has a better running game than any Oregon has faced this year. The Ducks may accept more risk of explosive plays to stop an offense that attempts to grind it out. But then, any defense has challenges when faced with the Ducks’ offense. The Ducks have hung 40+ on teams that give up less per game than Ohio State. While the Ducks may be content to let Cardale Jones try to beat them with his arm, concentrating on stopping the running backs would be a fatal error for Ohio State. What worked against Wisconsin and Melvin Gordon would not work so well against Oregon. So, even though this is the year of the offense, the battle may still come down to defense: can Oregon keep Ohio State’s running game out of the end zone, and can Ohio State find a solution to Marcus Mariota & Co.? Just don’t expect a 7-0 game, except briefly in the first quarter.